Shinsengumi, a group of young men recruited by the Bakufu to protect Kyoto from radical Imperial House loyalists in the tumultuous Bakumatsu period, is romanticised and idolised in Japan despite its limited place in history. This article attempts to comprehend this phenomenon by locating the closest crystallisation of popularly imagined Shinsengumi in Moeyo ken, a popular historical fiction by Shiba Ryōtarō. Antonio Gramsci explains readers are attracted to popular literature because it reflects their ‘philosophies of the age’, which may be discovered by examining popular heroes with their subsequent replications. This article will identify why Shinsengumi is appealing by comparing Shiba’s hero in Moeyo ken with its twenty-first century reincarnation in Gintama, a popular manga series, and by discerning reader response to Moeyo ken from customer reviews on Amazon.co.jp. It will be demonstrated from these studies that a likely reason for the Japanese public’s romanticisation of Shinsengumi in recent years could be their attraction to autonomous, self-determining heroes who also appreciate the value of community. This article is an attempt to introduce and explain the widespread romanticisation and celebration of Shinsengumi, a previously unscrutinised, yet nevertheless fascinating social phenomenon in Japan.1 Shinsengumi was a group of young men recruited by the Bakufu to secure order and safety in Kyoto to counter terrorism staged by unruly jōi shishi (Imperial House loyalists). Their contribution to history is rather limited that at most, less than a page is allocated for them in history dictionaries such as the Great Dictionary of Japanese History.2 In short, not much is written about Shinsengumi other than their small victories and their anachronistic fate shared with the Bakufu’s downfall. However the group’s popularity is the inverse of their historical relevance. For example, a quick search on Amazon.co.jp leads to 829 results just in the category of Japanese books.3 An unrestricted search further reveals widespread commercialisation beyond comprehension and imagination. Shinsengumi-related products range from conventional media such as novels, games, manga, films and dramas to quirky items such as figurines, accessories, pets’ costumes and even an idol group, Shinsengumi Lien. Their popularity is also noteworthy since their earliest appearance in popular media could be traced back to the 1920s.4 A critic of popular culture, Ozaki Hotsuki, notes that Shinsengumi’s popularity has also been consistent throughout history in contrast to the fluctuating popularity of other historical figures from the same period.5 Universality of their appeal is also suggested from their warm reception in other countries such as Taiwan and South Korea.6 These factors suggest fascination with Shinsengumi is neither a trendy fad nor a manifestation of Japanese people’s cultural penchant for tragic samurai. Since historical accomplishments do not explain why Shinsengumi is romanticised and idolised, this article will discover why this particular group of young men continue to appeal to the Japanese public by looking at popular imaginations. First, it will be advanced that the characterisation of Shinsengumi in Moeyo ken (Blaze, My Sword)7, a taishū bungaku8 by Shiba Ryōtarō (1923-1996), is the closest crystallisation of popular romanticisation of the group. Then, the significance of taishū bungaku will be examined to demonstrate that a comparative study of popular fictional heroes and their replications could reveal the masses’ consciousness. On this basis, Shinsengumi’s popularity will be explained by comparing Shinsengumi in Moeyo ken and its replication in Gintama (Silver Soul),9 a manga series by Sorachi Hideaki, and by discerning reader response to Moeyo ken from customer reviews on Amazon.co.jp. According to Antonio Gramsci, entertainment in this context denotes more than amusement.26 Entertainment distilled in popular literature is ‘an element of culture’ as it adheres to changes in ‘the times, the cultural climate and personal idiosyncrasies’.27 These elements are produced through a careful calculation to make a novel successful by appealing to the moral and scientific ‘philosophy of the age’: the deeply embedded ‘feelings and conceptions of the world predominant among the “silent” majority’.28 Heroes in popular literature are thus able to attract readers because their narratives reflect the masses’ ideals. If the hero in Moeyo ken is our key to deciphering the masses’ consciousness, how do we identify the elements of entertainment distilled in him? This requires a scrutiny of how readers locate their own model heroes and compasses since the entertainment value of a work is ultimately judged by the audience.33 For this purpose, the practice of ‘sequel-writers’ who ‘revive’ and ‘recreate’ heroes of successful popular fiction with ‘new material’ is noteworthy since modifications are made to accommodate changing social sentiments.34 We may therefore discover why the masses are drawn to Shinsengumi by comparing Shiba’s heroes in Moeyo ken, the prototype of contemporary representations of Shinsengumi, with its reproductions. In turn, this could elucidate the underlying reason for popular romanticisation of Shinsengumi in contemporary Japan. Another reason for using Gintama lies in its fandom characterised by a strong female fan base38 and the male-oriented Jump readership claimed to encompass ‘the under-tens to the over-sixties’.39 Coupled with the Jump manga production system which strongly values and responds to fans’ opinions, the nature of Gintama’s fandom suggests the series is shaped to meet the demands of a relatively heterogeneous and large group of readers. Representations of Shinsengumi in Gintama could therefore be considered as a reflection of the group’s social images in the twenty-first century. Secondly, a caveat must be imposed that in examining representations of Shinsengumi in Moeyo ken and Gintama, this article will consider the authors’ renditions of Hijikata Toshizō as reflecting the public’s perception of Shinsengumi as a whole. Not only is Hijikata the main protagonist of Moeyo ken and a major supporting character in Gintama, he also appears to be popularly appreciated as the epitome of Shinsengumi, the embodiment of its values and virtues. As noted previously, most Shinsengumi-related texts are focused on Hijikata, even though he is only the vice commander. The public’s adoration of Hijikata is also reflected in NHK’s broadcasting of Shinsengumi!! The Last Day of Hijikata Toshizō as a sequel to the taiga dorama (grand fleuve drama), ‘Shinsengumi!’.40 As a particular genre of historical narrative that ‘encourages and integrates present Japan by remembering and celebrating the past’, taiga dorama influences, and is influenced by the zeitgeist of the Japanese society..41 Like heroes of popular fiction, popular taiga dorama heroes exhibit values which resonate with the Japanese public. However, in the case of Shinsengumi!, it is arguable that NHK’s representation of Shinsengumi was insufficient to satisfy the public’s longings.42 The drama series was focused on Kondō, the head of Shinsengumi, and ended with his execution. Thereby Hijikata’s subsequent struggles against the new government were omitted from the series. However, viewers’ persistent demand forced NHK to eventually produce an unprecedented sequel about Hijikata’s final days in 2006, two years after the original taiga dorama was broadcast.43 This vignette reveals that Hijikata Toshizō is critical to complete popular romanticisation of Shinsengumi. Focusing our scrutiny onto Hijikata would therefore be more productive than canvassing different Shinsengumi members or reducing Shinsengumi into a single identity. To confirm whether the metamorphosis of Toshizō into Tōshirō corresponds to contemporary readers’ imagination of Hijikata Toshizō, customer reviews of Moeyo ken on Amazon.co.jp will be examined, since the reviewers tend to equate Shiba’s protagonist with the actual historical figure.44 These reviews are not quantitatively and qualitatively sufficient to draw a comprehensive ethnography of the fandom; only 152 reviews were published in the period from late 2000 to August 2009, and the reviewers remain anonymous. But the reviews are nonetheless useful to grasp a preliminary understanding of how readers imagine Hijikata because the time of publication is close or corresponding to the period when Tōshirō of Gintama is being produced. Also, anonymity of private criticism such as Amazon.co.jp reviews allows reviewers to express frank opinions. Ann Steiner notes that private criticisms commonly feature ‘personal interpretation or experience of a text’, expressions of ‘frequently heightened emotion’, the degree of which is relative to the degree of anonymity, and self-expression/ self-exposition.45 That is, Amazon.co.jp reviews display readers’ intimate interpretations and experiences about Hijikata Toshizō. Therefore, a scrutiny of these reviews could reveal the readers’ perceptions of the hero. Toshizō’s reason and spirits lie in the determination to accomplish his aesthetics as a kenkashi, a fighter, rather than the more sophisticated and chivalrous samurai or shishi. The protagonist moves from the outskirts of Tokyo to Kyoto in response to the Bakufu’s recruitment of the shogun’s bodyguards. Together with his friends, Toshizō soon becomes the backbone of Shinsengumi, a Bakufu protection squad consisting of men from various classes and walks of life. Having appointed himself as the vice commander, Toshizō successfully disciplines and organises the group into a powerful military corps by adopting makoto (sincerity) as trademark and adopting Kyokuchū hatto, a strict code of conduct attracting seppuku if violated. Such stern determination and ruthlessness award Toshizō with notoriety as the demonic vice commander among residents of Kyoto and his enemies. Concurrently, Shinsengumi’s reputation also peaks with a successful raid on a secret jōi shishi meeting at the Ikedaya Inn. But their glories are short-lived as Shinsengumi descends alongside the Bakufu’s downfall. Kondō’s execution is ordered by the new government and many core members also perish in battles. Nonetheless, Toshizō and remaining members continue to fight against the forces of the Meiji Restoration and even join the movement to establish the Republic of Ezo in Hokkaido. Toshizō, now the republic’s deputy minister for military, continues to be driven by his aesthetics as a fighter. Contrary to other ministers seeking to surrender to the new government, he charges out for the last time to fight his enemy. When an opponent soldier demands his identity, Toshizō, after deliberating for a moment, declares himself as not the deputy minister of the Ezo Republic, but as the vice commander of Shinsengumi. The stunned soldier questions Toshizō’s intention, only to become further baffled when our hero proclaims, ‘I believe I have already stated my agenda. If the vice commander of Shinsengumi has a reason to visit the opponent’s Council of War, it is because he seeks to slash the members of the Council’.47 These become Toshizō’s last words as he falls from the soldier’s gunshots. Thus an end comes to the tumultuous fate of Toshizō and Shinsengumi, and to their fleeting yet blazing appearance in Bakumatsu Japan. As a text, Moeyo ken is open to numerous interpretations. To readers familiar with classic Japanese tragic heroes such as Minamoto no Yoshitsune, Toshizō may appear as another noble, but failed hero.48 On the other hand, the close intertwining of Toshizō’s life with Bakumatsu history may inspire others to read it as a nationalist discourse about an ambitious, youthful hero whose life merged with the making of the Japanese nation like Sakamoto Ryōma.49 That is, Shinsengumi as depicted by Shiba could be tragic heroes, exemplary Japanese citizens, charismatic individuals, all at once or none of these. Although interesting, these interpretations do not explain Shinsengumi’s popularity as they are no more than fragmented speculations, void of voices of the actual fans ‘who appropriate popular texts and reread them in a fashion that serves different interests’.50 Discovering why this particular characterisation of Hijikata Toshizō is admired necessitates an inquiry into popular perception. Recalling that popular heroes of taishū bungaku become revived with revisions to meet changing social sentiments, this section will introduce the twenty-first century reincarnation of Hijikata in Gintama. Sorachi presents his interpretation of the popular hero by transporting Shinsengumi into a science-fiction, periodical comedy set in the fictional city of Edo, a mix of actual Edo from the Bakumatsu period and present Tokyo. In the manga series, gaijin (foreigners) are replaced with Amanto, extra-terrestrial aliens who invaded the land of samurai and subdued the Bakufu into their puppet. Amanto technology has transformed Edo into a hybrid of old and new; people still wear kimono, albeit in modified forms, but become hyped over the latest game console, Owee.51 Like their real counterpart, samurai in Gintama are prohibited from bearing swords in public and thereby, effectively deprived of their once-honourable warrior status. Gintoki, the main protagonist and a jōi shishi-turned jack of all trades, is not afraid to challenge the currents of his time as he continues to carry a wooden sword. Together with his assistants, Gintoki pursues his way of the soul while working as ‘Odd Jobs Gin’ in the downtown area of Kabuki-cho. In the course of their work, the Odd Jobs gang encounter many colourful residents of Edo ranging from Mademoiselle Saigō Tokumori, an ex-jōi shishi gay club manager, to the Shogun, Tokugawa Shigeshige.52 These characters typify Sorachi’s parodying of reality in Gintama as they are similar, but not identical, to the actual historical figures. Shinsengumi is likewise reincarnated with a different kanji name as Edo police force. With Hijikata Tōshirō (hereafter Tōshirō) as the ruthless vice commander, Shinsengumi joins Gintoki’s adventures on many occasions. Material aspects of Sorachi’s Shinsengumi drastically differ from those of Shiba’s Shinsengumi; Tōshirō and his company ride patrol cars and use firearms such as bazookas in addition to their prized swords. Yet when it comes to personalities, Sorachi’s Tōshirō is quite close to Shiba’s Toshizō. The nature of Tōshirō’s attachment to Shinsengumi is revealed in an episode where the Bakufu orders Shinsengumi to protect a corrupt Amanto official from jōi terrorists. When his subordinates complain about the irony inherent in police protecting the Amanto official who is technically a criminal, Tōshirō simply responds Shinsengumi are not Bakufu subjects. He asserts Shinsengumi are subordinate to none other than the head of Shinsengumi, Kondō, who provided a place of belonging for them, ‘uneducated rogues who knew nothing but how to swing a sword’.54 Having self-analysed his capacities, limitations and circumstances, Tōshirō is aware that his sole talent in fighting could only be realised through Shinsengumi in times when sword-bearing is forbidden. He thus acknowledges Shinsengumi as being pivotal to his self and dedicates his life to protect it. The vice commander further explains to his men that as the head of Shinsengumi’s kindness will not let him ignore anyone or even an Amanto alien in danger, Shinsengumi will gladly accede to his will and save the alien. Sorachi’s character is unconcerned about the illogicality of his actions as long as it suits his logic that Shinsengumi, their home, is preserved by ensuring the head’s authority and integrity are upheld. Toshizō’s stern determination to practise his aesthetics of life as a fighter is also vividly illustrated in his anachronistic, futile fights against the new government resulting in death. It is important to note that he is aware of the drastic changes to his surroundings and the irrationality of his actions as his efforts will only result in adverse outcomes. Nonetheless, his self-determination as a Shinsengumi fighter is not swayed by these factors. Rather, it could be argued that Toshizō willingly advances to his death at the enemies’ hands because dying in combat as the Shinsengumi vice commander completes his self-actualisation. In short, Shiba’s ideal hero is a man whose personal philosophy defies worldly logic and rationality. If you want Kondō’s head, you’ve gotta beat me first. No one can pass through me. No one can ruin our soul. I’m the last fortress protecting Kondō, the last sword protecting Shinsengumi. Tōshirō eagerly stakes his life to fight for Shinsengumi, the crystallisation of his life. Like Shiba’s hero who even welcomed death to advance his aesthetics as a fighter, Sorachi’s twenty-first century rendition of Hijikata is not afraid of fatal dangers inherent in his pursuit of personal aesthetics. Not once did I fight for this cheap country. Whether this country or the samurai comes to an end – I don’t care. I’ve never cared about it from the beginning. These words are accompanied by a collage of the protagonist’s friends, including Shinsengumi.64 Here, an overlap of Gintoki’s and Tōshirō’s personalities could be observed as they both value personal kinships and consider this aspect of their personality as a guiding principle of life. Being another reincarnation of Toshizō, Gintoki is determined to live according to his ideals whether or not he is right. Until the end, Hijikata Toshizō in Moeyo ken is driven by a personal determination to actualise his talent in fighting through Shinsengumi. Similarly, the life of Gintama’s Hijikata Tōshirō, the twenty-first century reincarnation of Shiba’s Toshizō, is driven by his determination to protect Shinsengumi. The reasons for their attachment to Shinsengumi differs slightly as Toshizō is concerned more with self-actualisation as Shinsengumi in contrast to Tōshirō, who identifies Shinsengumi as his sanctuary. However, both characters share a common attribute; their determinations are unswayed by any external influences such as changes in the political climate or in their personal circumstances. Turn of fate expels Toshizō from the status of an honoured and feared Tokugawa samurai and turns him into the enemy of the emperor and state. It also forces Tōshirō to break the very code he imposed on Shinsengumi and thereby robs his standing as the vice commander. But both characters are not dispirited by these changes; Toshizō continues to fight as Shinsengumi to his very death even though the organisation has lost all legitimacy and Tōshirō continues to fight for Shinsengumi’s survival even though he has been dishonourably discharged from the force against his will. In short, Toshizō and Tōshirō are strong and single-minded heroes who are dictated by none other than themselves. Moreover, they both have the strength to pursue their personal philosophies about life against thecurrents ofthe times. Viewed in this light, they could be described as autonomous, self-determining heroes. Self-determination theory contends humans are naturally growth-oriented beings who attempt to ‘master and integrate their experiences into a coherent sense of self ’.65 Individuals are inclined to exercise autonomy, i.e. to ‘regulat[e] one’s own behaviour and experience, and gover[n] the initiation and direction of action’.66 This trait could be found in both renditions of Hijikata as the character’s selves form the centre of initiation and agency for their actions. In Tōshirō’s case, his attachment to Kondō and Shinsengumi does not diminish his autonomy because his reliance on them is an act of volition flowing from his own assessment of his self and surroundings. In short, both characters are driven by their personal aesthetics, which are based on a strong awareness of their selves. There is nearly forty years of time difference between Moeyo ken and Gintama. During this period, Japan and her people have experienced dramatic changes as the golden period of rapid economic expansion gave way to the bust of economic bubble, and subsequently to the Lost Decades. In light of these changes in society, it is highly noteworthy that Toshizō’s almost-reckless drive to accomplish his aesthetics continues to be a defining characteristic of the twenty-first century remake of Hijikata, Tōshirō. Indeed, time has not failed to mark a difference between the two versions. Tōshirō exhibits attachment to Shinsengumi as a community of comrades and considers himself as the living shield for Shinsengumi. In contrast, Toshizō considers himself as the living embodiment of Shinsengumi. Nonetheless, these characters demonstrate that modern- day consumers continue to romanticise Hijikata Toshizō as a self-determining individual who is equipped with the fortitude required to pursue one’s ideals in harsh times of reality. To establish a stronger connection between the popular romanticisation of Hijikata identified from the comparative study and the masses, this section will present readers’ perceptions of Hijikata manifest in Amazon.co.jp reviews of Moeyo ken. 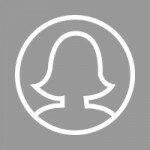 Reviews have been screened to eliminate multiple or unrelated entries and processed through a set of questions three times to create a ‘circular and continually adaptive’67 flowchart. That is, results from first and second observations were used to identify recurring themes and to re-design questions and response categories. Responses to question four are most relevant as they relate to the readers’ construction of Hijikata. 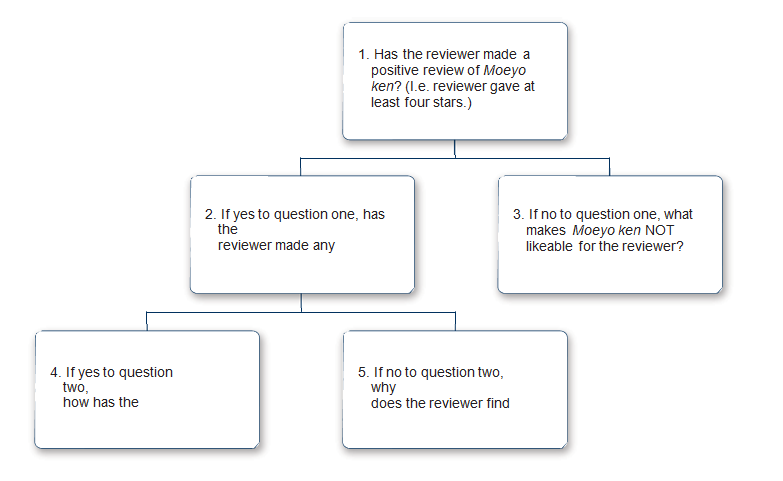 Out of 152 reviewers identified, 149 uploaded positive reviews as only three awarded Moeyo ken three stars or less, and 103 reviewers commented on Hijikata’s characteristics. 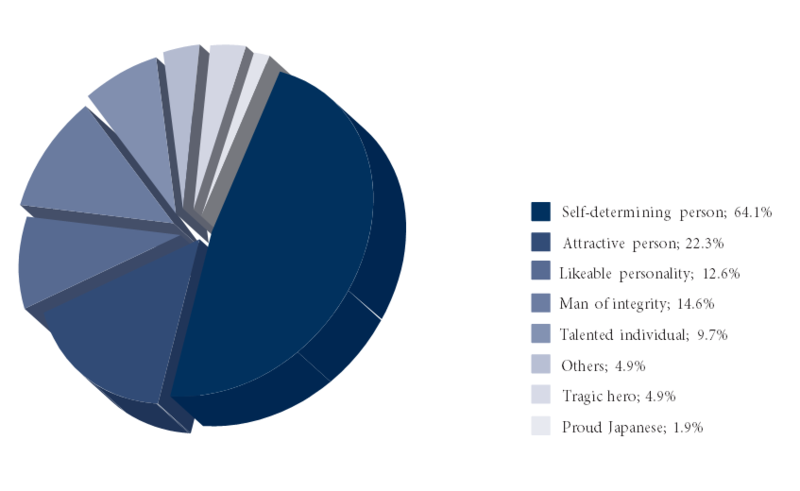 At the end of the third stage of analysis, readers’ views of Hijikata could be categorised as follows: a) a tragic hero, b) someone who makes the reader proud of being Japanese, c) a self-determining individual, d) an attractive individual because he is kakkoii (cool), heroic or antiheroic without further elaboration of these descriptions, e) a person with a likeable personality (e.g. being humane, empathetic, down-to-earth and/or straightforward), f) a man of integrity, g) a talented individual, and h) others. The first three response categories were adopted to check if a response corresponds to likely approaches to reading Moeyo ken previously canvassed in the article. The latter were established after two counts of review analysis to make a coherent synthesis of the responses. “The times are not a matter of concern. Victory and defeat also need not be discussed. A man must follow his envisioned aesthetics to the grave”. Many readers appear to agree as 21 out of 23 users rated this review as useful. Others also similarly note that they view Hijikata’s life as ‘a compass for life’, or that they could re-evaluate ‘everything within [their selves], including the course of life and personal values’.69 (2009/3/20) and Chīda, Kono sakuhin wo yonde hon wo yomu you ni natta [I began to read books after reading this work] (2004/9/28).] Not only do these responses reflect the nature of popular literature as a reflection of one’s ideals, they confirm Hijikata is popularly imagined and loved as a hero driven by self-determination. The following findings could be drawn from identifying popularly imagined Hijikata Toshizō as an autonomous, strong-willed hero. Firstly, as taishū bungaku entertains its audience by appealing to their philosophy and sentiments, readers’ attraction to Toshizō in Moeyo ken could be evidencing their sympathy for and synchronisation with the self- determining hero. The character’s appeal must be considered in light of the fact that he was formulated in tune with the zeitgeist of rapid economic development within Japan during the 1970s. Dreaming of self-actualisation amidst economic vivacity, the masses would have easily identified with Shiba’s pugnacious, peasant-born hero who actualised himself into the vice commander of Shinsengumi during the dynamic Bakumatsu period. However it should also be noted that individual drives and aspirations did not characterise Japanese society in those times as Japan astonished both domestic and international observers with her display of strong communitarianism.70 That is, the people needed to conform to social roles imposed by social and structural constraints embedded within their communities and organisations such as the workforce, school, neighbourhood and household. In this sense, individuals’ desire for self-determination could have been frustrated by constraints in their social realities. It is also likely that this frustration was also aggravated by the strike of consumerism and materialism, which further befuddled individual searches for personal philosophies about life. With the demand for conformism on their shoulders and lost in the quest for self identity, the masses would have found Toshizō’s strong sense of self identity and his strength to defy the conventions to actualise himself tremendously attractive. Secondly, the depiction of Tōshirō, the contemporary version of Hijikata Toshizō, as a self-determining hero in Gintama indicates that the masses’ empathy and yearning for an autonomous hero has not diminished in modern-day Japan. Indeed, present romanticisation of Hijikata in this manner is most likely attributable to the enduring popularity and influence of Shiba’s characterisation of the hero. Yet a close examination of Tōshirō’s socio-historical context suggests that the nature of current demand for a self-determining hero is not identical to the masses’ attraction to Toshizō in earlier times. No doubt contemporary idolisation of Hijikata as an autonomous hero is also a likely result of the public’s frustration with finding and pursuing their individual goals. But they are frustrated for different reasons because it has become apparent that Japanese society has also lost a sense of direction. That is, not only are people’s efforts to find their individuality being hindered by social and cultural constraints, the society is also incapable of providing the masses with a sense of direction as it is besieged by various problems such as a fading economy, increased demand for families and individuals to undertake jiko sekinin (self- responsibility), threats to national security and the draining pension fund, to note a few.71 As a product of the 2000s, Tōshirō’s display of self-determination should be appreciated as a response to these problems. The masses of this age have witnessed the dangers associated with conforming to social demands as the society cannot assure the people of their future course. Consequently, they face ‘greater uncertainty and apprehension, and have little hope for the future’.72 In this context, it is not surprising that Tōshirō is idolised as a modern-day hero since he is aware of the kind of life he wishes to lead, and is able to put it into practice. This difference in Tōshirō’s textual context also relates to the final finding to be discussed in this article. It has been noted that the dynamics between the vice commander and Shinsengumi in Moeyo ken and Gintama are different as Toshizō seeks death as a Shinsengumi fighter and Tōshirō risks death to protect other Shinsengumi members. This signifies a notable shift in the masses’ yearnings as their contemporary hero is not only autonomous, but also shares a filial kinship with people in his surroundings. As contemporary Japanese society has become stripped of the myth of homogeneity and tainted with concerns for increasing disparity and isolation, her people have come to crave a sense of community. In this climate, reincarnating Hijikata into a lone wolf would have been insufficient to create a popular hero. Tōshirō could become popular in the twenty-first century because his strong bond with Shinsengumi members constitutes the backbone of his personality in addition to his drive for self- determination. With their backdrop clouded by frequent media reports about problems of hikikomori, family breakdowns and neighbours turning into strangers, the public could only admire Tōshirō, who chooses to protect Shinsengumi, his community. Readers are kindly reminded that popular understanding of Shinsengumi’s spirit could be located in its vice commander, Hijikata Toshizō, because his dedication to the organisation and his death as the end of Shinsengumi are indispensable to the myth of Shinsengumi. In this respect, reproductions of Hijikata in Moeyo ken and Gintama could be appreciated as reflecting popular imaginations of Shinsengumi as autonomous heroes. Equating such a perception of Shinsengumi to the Japanese public’s imagination requires further research involving a wider number of samples across different time periods, and a more systematic methodology. But this study nonetheless provides a foundation to understanding a social phenomenon never scrutinised previously; future studies about the relationship between popular heroes and public consciousness in contemporary Japan could begin by theorising the romanticisation of Shinsengumi as evidence of the public’s desire for self-determination and a sense of belonging. Amazon.co.jp., Amazon.co.jp. Retrieved from http://www.amazon.co.jp/. Aoyama, T., ‘Eureka Discovers Culture Girls, Fujoshi, and BL: Essay Reviews of Three Issues of the Japanese Literary Magazine, Yuriika (Eureka)’, Intersections: Gender and Sexuality in Asia and the Pacific, no. 20, (2009). Retrieved 12 August 2009, from http://intersections.anu.edu.au/issue20/aoyama.htm. Deci, E. L. and Ryan, R. M., Handbook of Self-Determination Research (Rochester: The University of Rochester Press, 2004). Furlong, A., ‘The Japanese Hikikomori Phenomenon: Acute Social Withdrawal among Young People’, Sociological Review, vol. 56, no. 2 (2008), pp. 309-25. Gramsci, A., Forgacs, D. and Nowell-Smith, G., Selections from Cultural Writings (London: Lawrence and Wishart, 1985). Heibonsha, (ed. ), Nihonshi daijiten [Great Dictionary of Japanese History] (Tokyo: Heibonsha, 1993). Hillsborough, R., Shinsengumi: the Shogun’s Last Samurai Corps (North Clarendon, VT: Tuttle Publishing, 2005). Jenkins, H., Textual Poachers: Television Fans & Participatory Culture (London: Routledge, 1992). Kato, H., Powers, R. G. and Stronach, B., Handbook of Japanese Popular Culture (New York: Greenwood Press, 1989). Kato, S., A History of Japanese Literature: From the Manyōshū to Modern Times, Sanderson, D. (trans. and ed. ), new abridged ed., (Surrey: Routledge, 1997). ———, ‘Nihon bungakushi josetsu [An Introduction to the History of Japanese Literature], 15 vols., vol. 5, Katō Shūichi chosakushū (Tokyo: Heibonsha, 1980). Keene, D., Five Modern Japanese Novelists (New York: Columbia University Press, 2003). Kinsella, S., Adult Manga: Culture and Power in Contemporary Japanese Society (Richmond, Surrey: Curzon, 2000). Kingston, J., Contemporary Japan: History, Politics, and Social Change since the 1980s (New York: Wiley-Blackwell, 2010). Lee, S., ‘Taiga dorama janru no tōjō to sono shakaiteki imi no keisei katei [The Politics of Taiga-drama: Advent and Process of the Formation of Social Meaning as a Genre]’, Tōkyō daigaku daigakuin jōhō gakkan kiyō [Journal of Information Studies], vol. 70 (2006), pp. 147-69. Matsumoto, K., Shiba ryōtarō – shiba bungaku no basho [Shiba Ryōtarō – The Place of Shiba Literature] (Tokyo: Gakushū kenkyūsha 2001). Matsuura, R., Shinsengumi (Tokyo: Iwanami shoten, 2003). Morris, I., The Nobility of Failure: Tragic Heroes in the History of Japan (Harmondsworth: Penguin, 1980). Murakami, Y., Kumon, S. and Satō, S., Bunmei to shite no ie shakai [Ie Society as a Civilisation] (Tokyo: Chūō kōronsha, 1979). Nakamura, M., Contemporary Japanese Fiction: 1926-1968 (Tokyo: Kokusai Bunka Shinkokai, 1969). Nakao, H., ‘The Legacy of Shiba Ryōtarō (In Memory of Shiba Ryōtarō)’ in Starrs, R. (ed. ), Japanese Cultural Nationalism: at Home and in the Asia Pacific (Folkestone: Global Oriental, 2004). Nihon Hōsō Kyōkai, ‘Shinsengumi! Zokuhen’ [Sequel to Shinsengumi!] (2006). Retrieved 23 June 2009, from http://www.nhk.or.jp/drama/html_news_shinsen.html. Nishimura, S., Saraba, waga seishun no shōnen jampu [Farewell, Shonen Jump of My Youth] (Tokyo: Gentōsha bunko, 1997). Oricon, ‘Ichiban waratta manga ichi i, joseikara ninki no gintama’ [The Funniest Manga, Gintama is Popular among Women]. Retrieved 20 August 2009, from http://life-cdn.oricon.co.jp/news/080422.html. Ozaki, H., Taishū bungaku ron [Theories on Popular Literature] (Tokyo: Kōdansha, 2001). Saaler, S., Politics, Memory and Public Opinion: The History Textbook Controversy and Japanese Society (Munich: Iudicium Verlag, 2005). Sakai, C., Nihon no taishū bungaku [Japanese Popular Literature], trans. Asahina, K. (Tokyo: Heibonsha, 1997). Schilling, M., The Encyclopedia of Japanese Pop Culture (New York: Weatherhill, 1997). Shiba, R., Moeyo ken jō [Blaze, My Sword 1] 5th ed., 2 vols., vol. 1 (Tokyo: Shinchōsha, 1996). ———, ‘Moeyo ken ge [Blaze, My Sword 2] 5th ed., 2 vols., vol. 2 (Tokyo: Shinchōsha, 1996). Shimozawa, K., Shinsengumi shimatsuki [The Chronicles of Shinsengumi] revised ed. (Tokyo: Chūō kōron shinsha, 1977). Smith, H., ‘The Media and Politics of Japanese Popular History: The Case of the Akō Gishi’, in Baxter, J. C. (ed. ), Historical Consciousness, Historiography, and Modern Japanese Values (Kyoto: International Research Centre for Japanese Studies, 2006). Sorachi, H., Gintama [Silver Soul], 36 vols. (Tokyo: Shūeisha, 2004-Publication in progress). ———, ‘Gin Tama. 20 vols., trans. Rosin, M. (San Francisco: Viz Media LLC, 2007-Publication in progress). Steiner, A., ‘Private Criticism in the Public Space: Personal Writing on Literature in Readers’ Reviews on Amazon’, Particip@tions, no. 2 (2008). Retrieved 19 September 2009, from http://www.participations.org/Volume%205/Issue%202/5_02_steiner.htm. Suzuki, S., Nihon no bungaku o kangaeru – bungakushi no kakikae ni mukete [Considering Japanese Literature – Towards Rewriting Literary History] (Tokyo: Kadokawa shoten, 1994). Turnbull, S., The Samurai Swordsman: Master of War (Tuttle Publishing, 2008). VanderStoep, S. W. and Johnston, D. D., Research Methods for Everyday Life Blending Qualitative and Quantitative Approaches (San Francisco, CA: Jossey-Bass, 2009). Yoshikawa, K., Shinsengumi! (Japan: Geneon Entertainment, 2005). ———, ‘Shinsengumi!! hijikata toshizō saigo no ichinichi [Shinsengumi!! The Last Day of Hijikata Toshizo] (Japan, 2006).